Transit rogue Karen Stintz has done it again—after spending the winter annihilating all of Rob Ford’s transit ideas, the TTC chair has taken another bold stand without the mayor’s blessing. She and TTC vice-chair Glenn De Baeremaeker have a shiny new $30-billion transit proposal for Toronto that they’ve dubbed “OneCity.” Altogether, the city would see 170 kilometres of transit expansion meted out over the next 30 years, with Toronto, the province and the feds each contributing an equal share of the money. 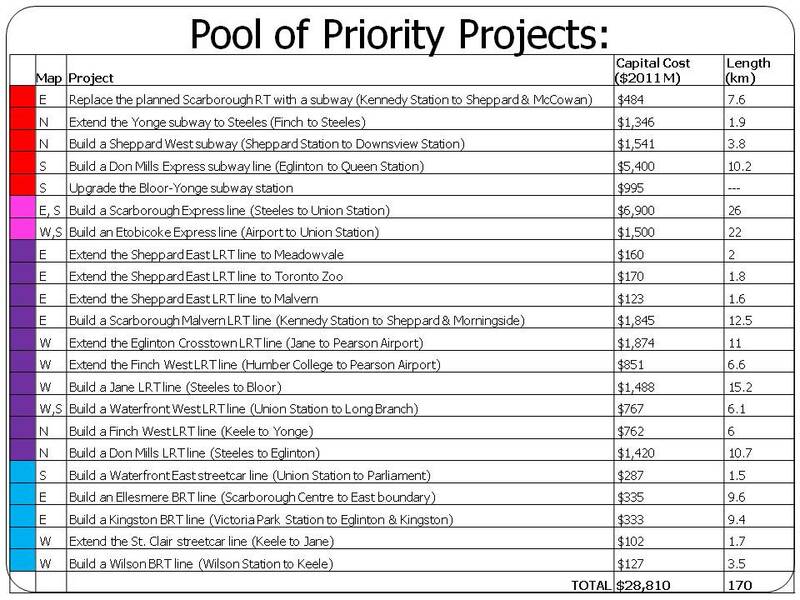 The priority projects would include six new or expanded subway or train lines, 10 new LRT lines and five new bus and streetcar lines (it’s like a public transit Christmas!). However, at least one part of the plan may cause Ford’s head to explode: the city’s portion of the funding would come through raising property taxes by about 2 per cent each year. It’s called a “current-value assessment uplift” and it would require the province to change the law so that property-tax collection is no longer revenue neutral for the municipal government. For the average Toronto homeowner, it would mean an extra $180 a year in property taxes once the plan is fully phased-in in 2016, or the equivalent of an automatic 1.9-per-cent rate increase every year. That’s over and above any traditional annual property-tax hike. The money raked in through the CVA uplift—$272-million per year, once fully phased in—would go into a dedicated transit-infrastructure purse, Ms. Stintz said. I LOVE KAREN!!!! KAREN FOR MAYOR!!!! If you are against your property tax bill being increased by $45 FOR THE YEAR to bring Toronto into the 22nd century, you should sell now and grab ya profit. Our subway system is a joke and needs to be updated. We call ourself a world class city, but we are not with the current TTC. Bozo Ford ( both of them) are just mad as its not their idea and why does he always fight against property tax increase ? Are these bozo for real?! Great job Karen!!! KAREN FOR MAYOR!!!! NOW!!!!!! You’re an idiot. How do you get 45$ FOR THE YEAR from the $180 a year increase?! Thats an INSANE property tax increase on a YEARLY BASIS. Karen is an idiot who should be shown the door by her constituents. Still waiting for the private sector to pay for it. A&%&ole Mark…allow me to encourage you to read… it would be an average of $180 once phased in in 2016.. it starts at $45 annual first… read and learn. Even at $180 per year, it worksout to less than $17 per month, less than $1 per day to build a true world class city. How else are you going to pay for it ? the non exisitent priate sector as per your bozo of a mayor? Mark..get back underground where u belong or back in Etobicoke where u belong with The Fords! JOHN, the devils are in the details. WHo in the city has their home valued at 437k? 1) how to pay for the operating costs (the plan essentially triples number of lines) once built? We can barely afford to pay for the current lines. 3) If Shepperd subway is not ‘dense’ enough for a subway, the Scarborough RT that runs through industrial, middle scarborough is? I’m all for a more centrist and compromising Mayor, but this is nothing more than a publicity stunt for someone that continues to ‘not’ want to run for mayor. 30 Billion in 30 years…. what a joke.. if some TTC booth collectors are making $100k per year which is 2 to 3 times more than what the job should pay.. You will be looking at a cost of 60 to 100 Billion in 30 years which is more realistic to the real cost of this expansion. Refer to Boston’s big dig and you’ll understand how these estimate are grossly under estimated. Congratulations Karen ! !…Dont listen to all these people who are just jealous that a smart very attractive woman like your self has the guts to tell it like it is. You obviously DON’T own anything! Hydro is going up by 70%. And now you want home owners to pay 2% tax increase on top of that? What freaking planet do you live on? Oh right, you don’t own anything do you!!! Get rid of the public sector unions, roll back everyone’s pay to that of the private sector and the gov’t will have all the money it needs and then some! KAREN DOES NOT RESPECT TAXPAYERS! WHO KEEPS VOTING IN THIS TRAITOR? Karen Stintz has been bought and paid for by the lefties. She has no respect for taxpayers.